As of late I've been back into one of my anti-productive, nothing gets written funks. I'm not sure if this is due to the fact that Azeroth has once again provided me with one excellent distraction, if my creative juices have been over tapped, or if I've simply become a bit lazy. It may very well be a combination of all of the above. However, I am posting right now to help combat some of this lack of blogging ambition for both me personally and perhaps even you. I am posing a challenge to you all. This is a creative challenge that may not necessarily be writing heavy (though it can be if you so choose! ), but it will require you to have some visual flare. I am offering you all a screen shot challenge. Fifteen days of screen shots that is; yes this was inspired a bit by Saga's 20 days of... challenge, but I wanted to do something with a bit of a visual twist. Now, there are a few points that go along with taking on this challenge, so let me lay them out for you. I promise I'll try to make this process as painless as possible! - All screen shots posted should be taken by you. If they are taken by a good friend of yours, permission to use the image and credit must be given. - Get as creative as you like. *Most* shots should be of the sort that doesn't include the UI, but there are naturally a few exceptions, such as you wanting to show off an achievement pop or something of the sort. - Edits and effects are fine, so long as they're not completely photoshopped and you can still very much tell that it's from World of Warcraft. - Have fun with this challenge. You may participate in this as little or as often as you please. You don't have to post 15 consecutive days or anything of that sort. - Link it up. If you participate in this challenge, please leave a link to your blog in the comments of this post so I can track who is all in on this. I'd like to make up a master list of those of you who partake in this little project and it would be a tad bit difficult if I can't find you all! - Explain as little or as much as you want. While the meat and potatoes of this challenge lies within the screen shot you post, you may explain the hows and whys for your reasoning of choosing such an image or event. The screen shot should be able to stand on its own, but words are more than allowed to enhance the experience. - You may, if you so choose, to do the topic suggestions out of order. Just be sure to keep track of the ones you have already completed! - Lastly and once again, have fun with this challenge! This is meant to help alleviate writer's block and to give us something slightly different to work on. Be visually creative along with being word creative. Tinker with something you may not have explored before. Exercise a different portion of your brain for once! Just have yourself some good ol' fashioned fun, and be sure to hit that screen capture button while you're at it. Find yourself perching in a particular tree as a druid? Have a certain hovel you like to hang out in on your undead rogue? Show us where it is, and why your character hangs out there. If you were to claim a place to call your own, where would it be and why? Show us an image that represents who you are, either in Azeroth/Outland or in real life. Proud of a boss kill? Excited about taming that rare? Over the moon about getting a title? Show us your greatest in game accomplishment! Show us an image of you pimping your favorite title and give us a reason why you dig it so much. Most of us have a favorite poet or song. Give us an image that you think represents your favorite line, or what line inspires you most. You should probably include said line and *maybe* give some explanation/reasoning behind it, unless you're feeling overly ambiguous. Show us the best screen shot you believe that you have ever taken and why you think it is the best (content, meaning, how you framed it, etc). If Azeroth was the real world, where would you vacation to? We all have the same starting zones where we begin our various quests, but where does your character actually hail from? Who are the people you hang out with day in and day out? Do you only hang out with your raid mates? Do you have a small, tight knit group of friends that you hang out with? Or are you a strange longer who just hangs out with your pets? Show us something that inspires you within World of Warcraft. This can be a character, a person, scenery that leaves you in aw, or whatever it is that strikes a cord in you. The inspiration it creates can be anything as well: Has this character inspired you to roll a certain class? Does a certain zone make you long to write a story about your character adventuring through that particular area? 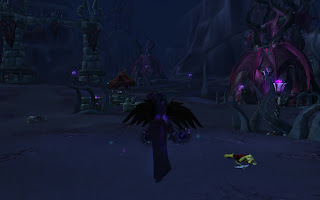 World of Warcraft is often described as cartoony and looking a bit, well, fairy tale-ish. Take a screen shot that makes you think of a fairy tale - use Disney inspiration if you must! Feel free to edit this screen shot a bit to enhance the fairy tale feel, or just get super creative with that in game camera! This looks like a lot of fun. Count me in (although it probably won't be a straight-on Day 1 to Day 15). I love it! The Dwarven Battle Medic will take up your challenge... but I plan to put my own, unique Dwarven spin on it. Thanks for doing this! I have been struggling to find topics and get posts finished lately, and I think that this is just the thing to get me going again. I love this! I was also trying to come up with a 20 days of screenshots meme, but your ideas are waaaay better! I'm looking forward to participating. What a great idea, thanks! Tome of the Ancient is dusting off her Azerothian camera and hitting the road! Late to the party, but I'm in! I'll design a special border/frame for use on my blog so they stand out. I recalled you mentioning something Jaedia, but somehow I missed you when I was putting together the list. Thanks for participating! I just came upon this myself and am definitely looking forward to taking part. I just posted my first one on Battle Medic. Saz, I am really curious to know what you think of the direction I took your challenge! I found my way here through Fannon's post and I think this might be the thing to get me blogging again. And since I absolutely love Fannon's twist, I'm probably going to do something along the same lines. I feel I enjoy writing most when it's complete fiction, so hopefully this will get the ball rolling again. I really dig your twist on this Fannon. As I said in that comment, I really look forward to your future posts! To the rest of you fine folks jumping in on this, likewise! I've loved everything that I've seen thus far, and I'm definitely excited to see what you all have in store. Count me in! I'm so stoked to get into this. I'll probably go with the original guidelines, because I don't want to copy Fannon. But good lord, do I love his take. @G5G - I have you all on the list! @Rioriel - Thanks for participating sir, loved the images as always! Huzzah! Looking forward to your posts! I know this is waaaay late but I'm starting this on It's For My RP Spec! ; actually, I started yesterday. Either way, it's a lot of fun already! It's never too late ; ) Welcome aboard, loving what you have up so far! Late as ever to the party, I've been able to resist no longer. Joining in too. I am not going the entire list on Chatmay, but I am picking a few and doing them to keep my blog going. That's more than fine m'dear! I love the first post you did. I tried to leave a comment on your blog itself, but alas Wordpress hates me when it comes to commenting for some odd reason. Welcome to the challenge! I'm a bit late I guess, but I'll be taking part in it more or less actively. :) Great idea, thank you for that.